CEITR Research Fellow, Dr. David Proudfoot and CEITR Chair, Dr. Mansureh Kebritchi have been published in the International Journal of Cognitive Research in Science, Engineering and Education. The article, “Scenario-based eLearning and STEM education: A qualitative study exploring the perspective of educators” explores the influence of a scenario-based eLearning mobile lab on STEM education through the eyes of elementary school educators. The innovative mobile STEM lab used in this study is the first of its kind in the nation for a K-12 school district, which enables this research to be of particular interest to educational leaders who are looking for alternative programatic approaches that make students more interested in science and improve their grades. 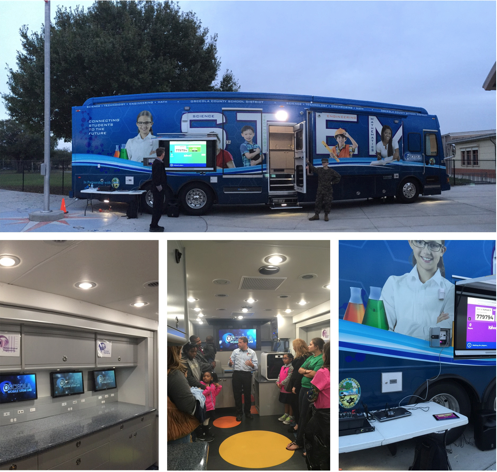 The Mobile STEM Lab aims to connect students to the future by creating engaging and exciting STEM experiences for students by immersing them in authentic scenarios that requires the application of STEM content to solve problems. This research was supported in part by the CEITR as a 2016 Research Fellowship project. The International Journal of Cognitive Research in Science, Engineering and Education is published two times per year, in June and December. Currently, the article is hosted online prior to being included in a final print and online journal issue and can be accessed at this location. To learn more about Dr. Proudfoot, you can view his SAS Faculty Research Fellow Spotlight . To learn more about Dr. Kebritch, you can view her biography as the CEITR leader. Congratulations to Dr. Proudfoot and Dr. Kebritchi!